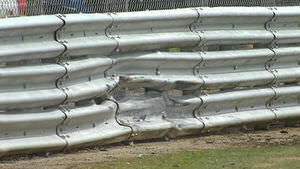 The British Grand Prix was red flagged after just one lap and a lengthy delay ensued whilst guardrail repairs were made. It was worth sticking around for the restart, though, as that's when the action really kicked off. Overtaking moves aplenty, and strategy decisions making the difference, meant there were fights to the very finish line. Mercedes suffered one retirement and one race victory, and the championship has closed up considerably. If you want to catch up with anything that happened across the course of the afternoon, relive the race with these Factbyte Factbox highlights. Kimi Räikkönen and Felipe Massa crash on the first lap, both out of the race. A one hour red flag period follows to fix the guardrail. Maldonado and Gutiérrez come together, with the Sauber out of the race. Rosberg retires with a gearbox problem, handing the lead to Hamilton. Bottas pits very late, rejoining in second, with Ricciardo rounding out the top three. Hello fellow Formula One fans and friends, are you all geared up for today's racing action? It's set to be fun and furious so you'd better stick around! Did you see qualifying yesterday? If you missed it, you missed out, because it was a fascinating session that has set us up nicely for today's race. Things you need to know before the action begins. Nico Rosberg starts from pole position, after snatching P1 from his teammate. Lewis Hamilton was out at the last minute but decided not to complete his final flying lap, dropping down the order to sixth place. Jenson Button and Nico Hülkenberg line up on the second row, having a great qualifying and capitalising on that final dry sector during the last lap. Pastor Maldonado didn't put on a spectacular show in qualifying but was 15th after the session. The Lotus driver was excluded from qualifying, however, after the car ran out of fuel and was unable to provide a sample to the FIA. He now starts 20th. Not quite last for Maldonado, as neither Caterham managed to complete a lap time within 107% for qualifying. All three drivers have been given special permission to race this afternoon, though. It's a great starting position for Jenson Button, who has spent most of the build up to the weekend suggesting all the pressure for a home win is on Lewis Hamilton. That's probably still true, but amusing that he then managed to outqualify the Mercedes driver. Talking of Button, he's turning Silverstone pick in memory of his father. Pink shirts everywhere, pink helmet for the weekend, all very pink. 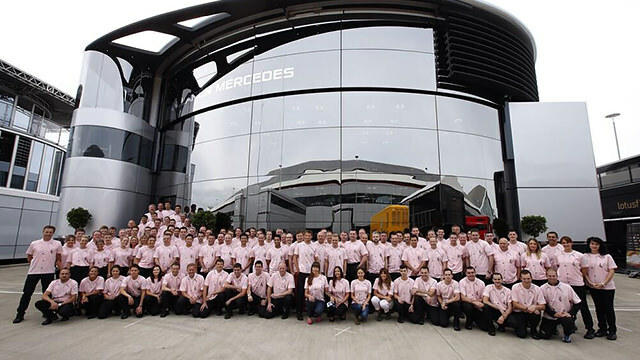 It's not just at Silverstone, either, pink supporters at home too! The Mercedes pair have only been beaten once so far this season, with Daniel Ricciardo taking victory in Canada. There's an opportunity this weekend, but Rosberg does start ahead, and Hamilton has the fire to improve in front of the home crowd. The Marussia pair proved just how far ahead of Caterham they are now, by making the right call at the right time and moving out of the first session of qualifying. Jules Bianchi starts the race 12th, whilst Max Chilton dropped back due to a gearbox penalty. There's a lot of attention on what could be achieved at the front, but there has to be some focus on the rear of the field. Bottas and Massa start 14th and 15th for Williams, whilst Alonso and Räikkönen are behind them, split by Max Chilton. With four relatively fast cars hoping to surge forward into the points, we could see a surge of overtaking at the start of the race. Felipe Massa might have been hoping for a better qualifying, to start his 200th Grand Prix higher up the order. Celebrating the achievement, Massa said: "I’m still very motivated to continue and to achieve more success. I feel very much at home at Williams and this feels like a team at the start of an exciting period in its history and I want to be a part of that. I’m feeling in great shape and want to keep adding more races to my growing tally." With half an hour to go, the pit lane opens, there are practice starts for all as they head out on track. Force India have both their drivers drawing to a halt at the end of the pit lane and then roaring away into the distance. The hard and medium tyres are on offer today (and wets if the weather turns), and Pirelli are expecting a two stop strategy to be the top choice. "For the 52-lap British Grand Prix, a two-stop strategy is theoretically fastest, although some drivers might even try a one-stopper, if they want to do something different from lower down the grid. Our prediction for the quickest strategy is medium-medium-hard, stopping on laps 23 and 45. A three-stop sprint strategy could also work (medium-medium-medium-hard) with stops on laps 18, 34 and 51. This however would leave drivers vulnerable of feeding into traffic during the closing stages of the race." Kevin Magnussen starts 5th: "Good position today, nice to have a good result for the McLaren fans, let’s hope for that. I think it will be difficult to finish much higher but we should try and keep the position." Tweet from @skysportsf1: "Problems for Hamilton. Reporting on the team radio of overheating with the right rear brake." As Hamilton was pulling away for his practice start, he asked the pit wall to check the right rear brakes - a lot of smoke, perhaps a small fire, he pondered. Paddy Lowe: "He just got the brakes a little bit hot on the way to the grid but it’s not an issue." According to official F1 weather types, the risk of rain for the race is 30%. Nigel Mansell, driver steward this weekend, is having a very close chat with Hamilton before the Brit climbs into his car. Last minute preparations on the grid as the mechanics start to clear. Umbrellas are up and over the driver cockpits, but mostly to shade them from any sun, rather than keep the rain out. Nico Rosberg looks cool and calm at the front of the grid. The German is leading the championship by 29 points, so a healthy gap at this point. Rosberg leads the pack away, most of the drivers are on the medium compounds with just two Ferrari drivers on the harder, orange sidewalled rubber. Polesitter Nico Rosberg complains over the radio that his start wasn't that great, but that was just a practice. The real thing is moments away. A lot of smoke pours from one of the Williams as the pack forms up slowly, and makes a slow getaway. Sebastian Vettel had a terrible start, dropping back to fifth. Accident between a Ferrari and a Williams. Safety car called. It's Felipe Massa and Kimi Räikkönen. There's huge damage to the Williams but he pulls it round and continues circling. Kimi is still in the car, attended to by marshals. Räikkönen is out of the car now, but is limping. He's helped away from the car by marshals/doctors. TV cameras didn't pick it up but the Ferrari looked all out of shape in the back of shot. Kimi Räikkönen runs off track, then back on, then off again. 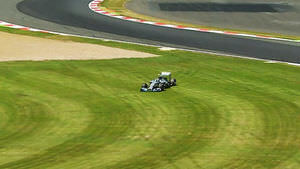 He hits the barrier on one side of the track, spins across to the other, collected by Massa who had nowhere else to go. That was a huge crash for Kimi, spinning round and round across the track and making contact with two barriers AND the Williams. With the red flag, cars have made their way back to the grid and are stopped. We're on lap 2 now, as the grid is after the finish line. Max Chilton has been into the pits, and is lining up at the pit exit ready to rejoin when the race gets going again. Massa has made it to the back of the grid and the mechanics are studying the rear of the car to make as many repairs as possible. Replays of the contact between Williams and Ferrari. Somehow, Chilton got up to tenth but is in the pits so will have to wait for the pack to clear before joining again. Massa is out of the car, the Williams is being pushed back to the pit lane. Race over for the Brazilian. It's just not good luck to celebrate anniversaries in Formula One. The marshals have cleared the track of debris, and are now checking the armco - there's a huge Ferrari-shaped dent in there, and they'll have to confirm it's safe to continue. Replays of the start also show that Sergio Pérez made contact with Jean-Éric Vergne. Into the first right-hander, Pérez was pitched into a spin by the Toro Rosso and was pushed off track. Both cars continue but at the rear of the field. Guardrail repair is necessary. Next update in 15 minutes. Some of the drivers are out of the car, pacing and waiting, chatting with their engineers. Tense times to remain focused but with a delay ahead. Max Chilton is stalking around the pit lane by himself, having a chat with the medical car driver. Magnussen is looking serene, having picked himself out a nice spot of grass to perch on. Replays show Kobayashi having to take to the grass to avoid the spinning Ferrari, and then bouncing back across a lengthy green section to rejoin the track. Felipe Massa, out of the race after one lap: "I didn’t see very well because there was just a car in front of me. I saw Kimi crash and he was coming into me very quick. I turned right completely and hit my rear left on his car. The car is very damaged. My clutch didn’t work on the start, so my car wasn’t moving. I was last, another problem like that… really a weekend to forget. I hope Kimi is fine because I saw it was a big crash, I hope he is fine." Tweet from @JRobertsF1: Alonso has switched from the hard to the medium on the grid. Grosjean and Perez have gone the other way. Tweet from @Marussia_F1Team: So a huge crash on the first lap, in which many were very very lucky, including Max who was struck in the mayhem around him. Max was on his way in for a nose change when the track went Red, so is currently at the end of the pit lane while the Team effect repairs. Incident involving Max Chilton under investigation - entering the pit lane after the race was suspended. Chilton also pointed out to his team earlier that the longer this delay goes on, the more likely we are that the rain will move in. Another 15 minute delay as the guardrail repairs continue. They are taking out the damaged strips of barrier and replacing them with nice straight ones. Chilton definitely dived into the pit lane when a marshal was waving a flag directly at him. You can see why it's a problem too, considering the number of personnel dashing about in the pit lane. Turn 1 incident involving Jean-Éric Vergne and Sergio Pérez under investigation - causing a collision. And then no further action. Reports on Kimi suggest he's okay but there's some concern about his ankle so he's being sent for an x-ray. Drive through penalty for Max Chilton - entering the pit lane after the race was suspended. Further review of the Kimi accident show one of the Ferrari wheels popped off upon impact with the first barrier. It flew across the track, hitting the nose of Chilton's Marussia before ricocheting back to where it came from. Tweet from @sarahholtf1: This delay allows us to say thank you to all the British GP marshals, some of who are now busy repairing the barrier Kimi squished. Race will be resumed at 14:05. Claire Williams: "It’s so sad for Felipe, this is his 200th race. He didn’t make it through the first lap but he did avoid an accident that could have been a lot worse. Valtteri made a great start, he’s up to P9. I hope he keeps that, there’s a bit of confusion over whether they’ll start to go back to their grid positions or not, but I hope he keeps P9." With the news the race is going to start again, drivers are making their preparations, balaclava's on. The safety car has taken up position at the head of the field, a safety car restart in just about five minutes. And the waiting crowds are cheering. Yellow flags, as the procession begins behind the safety car. The mechanics are dashing back to the pit lane again. That's two lots of running we've seen today, love it! 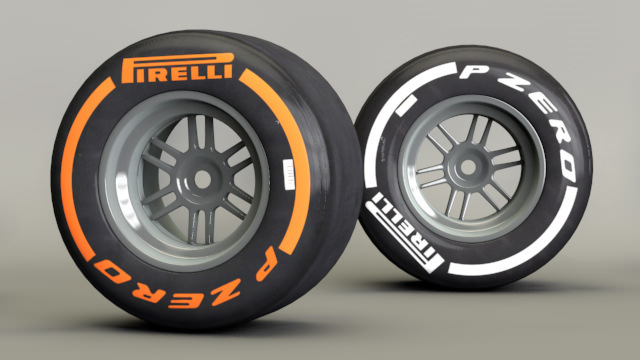 Alonso has switched from hard tyres to mediums. Vettel and Ricciardo have gone the other way, as has Grosjean, Vergne and Pérez. The safety car peels away and Nico Rosberg takes the restart with a great surge leaving Jenson Button standing. Bottas makes a pass on Kvyat, moving up to eighth place. Alonso, further down, is hustling Gutiérrez for 13th. Hamilton pushes Magnussen for third, but doesn't have the speed down the straight. He tries to brake later and it still doesn't work but Kevin runs wide, and loses the position anyway. Hamilton up to third. Max Chilton has exited the pit lane and taken up his position at the back of the pack. One lap later, and he's back in the pit lane. 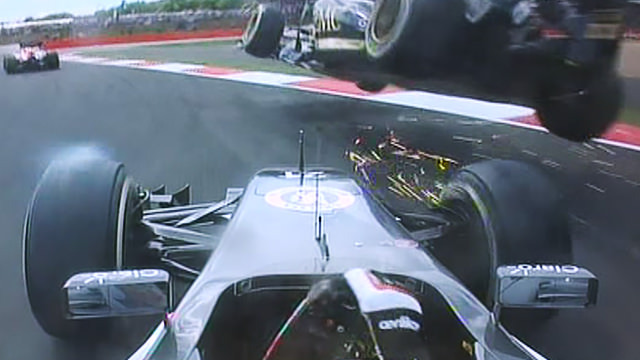 Hamilton dives down the inside of Jenson Button for what turns out to be an easy overtaking move for second place. Rosberg has a four second gap to second place, which is now his teammate Hamilton. 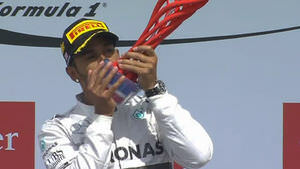 The crowd cheered madly as Lewis took the place from Jenson. Valtteri Bottas is also on a charge, dispatching Nico Hülkenberg quickly. The Force India had a quick look to try and regain the position, but gave it up as a bad job. There's a great battle for seventh place, with Nico Hülkenberg holding up a train of Ricciardo, Kvyat and Alonso - all within 1.5 seconds of each other. Alonso speeds past Kvyat for ninth place, it took a couple of corners to make that happen but he takes the place. Ricciardo closed up behind Hülkenberg, but couldn't make the pass, and that allowed Alonso to take the inside line and get ahead of the Red Bull. Now it's Alonso versus Hülkenberg... something we've seen many times before! Incident involving Fernando Alonso under investigation - out of grid position on original start. 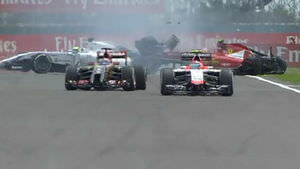 A penalty would ruin Alonso's day, the Ferrari driver on a complete flyer. He's passed Nico Hülkenberg and is leaving the Force India for dust. Hamilton isn't making much dent in Rosberg's lead, but it's not getting bigger either. The pair lapping at an equal pace at this point in the afternoon. Ricciardo is back on the rear wing of Hülkenberg, with Nico having the better engine for the straights, but Daniel having better cornering stability. Ricciardo does it at Stowe, squeezing past Hülkenberg to take eighth place. Disaster for Gutiérrez, Maldonado mounted his front wheel and he has a puncture. He beaches his car in the gravel trap. Vettel heads into the pit lane for his first stop of the day. Incident involving Pastor Maldonado and Esteban Gutiérrez will be investigated after the race - causing a collision. Marcus Ericsson is circling very slowly, the Caterham driver reports something broken on the car. He's advised to bring it back to the pit lane if it is safe to do so, and he does manage to get back to the garage. Tweet from @CaterhamF1: . @Ericsson_Marcus heads for the box, unfortunately to reture the car as he's reporting "front left suspension problem"
5 second stop/go penalty for Fernando Alonso - out of grid position. Valtteri Bottas is still scything his way through the field, he easily passes Magnussen to move into fourth place. Ahead of him, Jenson Button. It's incredible Maldonado is still in this race. Super slo mo replays show Gutiérrez just couldn't slow his Sauber down and ran into the side of the Lotus. The bump when Pastor hit the ground was incredible. 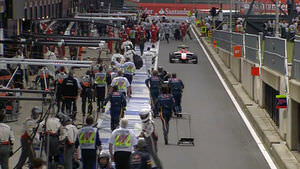 Daniil Kvyat leaves the pit lane after taking his first stop. He rejoins in front of Jules Bianchi. Alonso's take-no-prisoners attitude sees him dive past Magnussen and move up to fifth place. Daniel Ricciardo comes in for a pit stop, 2.7 seconds on the clock as he takes on the medium tyre after a hard tyre stint. Valtteri Bottas makes mincemeat of Jenson Button as he makes a move around the outside of the McLaren. Up to third for the Williams driver. Team radio to Bottas: "Brilliant stuff Valtteri." Rosberg gets the hurry up to push, as the gap is down to 2.5 seconds to Hamilton. The pair are heading towards their first pit window. Rosberg's pit stop puts Hamilton in the lead, but Nico rejoins in second so it will all depend on Lewis's stop. Alonso moves alongside Jenson Button, looking for fourth place. He backs out into the corner but Button has a lot of pressure on him as he begins another lap. Team radio from Rosberg: "Gearbox problem on the downshift." The team reply they are looking into it but can see no data at the moment. And it doesn't seem to be slowing Nico down yet. Ricciardo makes use of DRS to move past Hülkenberg and take 8th. Alonso is still chasing after Button. He'll want to make as much progress as possible before his pit stop, as there'll be the five second hold up once he goes in. Still no sign of Hamilton attempting to pit any time soon. Both Mercedes looking very fast as they play the long game. Adrian Sutil comes into the pit lane, from 13th place. All eyes on the pit lane as the Mercedes crew take up their positions. Lewis Hamilton comes in, it's a slow stop as he puts on the harder tyres. Team radio from Jenson Button: "The last two laps, Alonso has gone off the circuit at Copse." Vettel moves to the inside of Magnussen, who has a slow couple of corners and essentially hands his sixth place over to the Red Bull driver. Fernando Alonso comes in from 7th place, it's a long stop with his five second penalty added on. He rejoins in 9th place. Bottas and Button look to be attempting a one-stop strategy as neither have looked like pitting anytime soon. Alonso versus Hülkenberg part two, and it's not a huge battle this time. Alonso moves up to eighth. Magnussen comes in for his first stop of the day, he takes on the harder tyre and rejoins in 7th place. Hamilton sweeps past Rosberg as the German slows down. He reports problems on the upshift now too and wants to just get to the end. It's not going to happen, Rosberg has slowed right down, and takes to the grass as he's trying to get back to the pit lane. Yellow flags and DRS disabled, as Rosberg pulls way off track and stops on the grass. Rosberg was desperate to get going again, engine revving, pressing all the buttons he could find. Eventually he switches off, and removes the steering wheel. Race over. Rosberg takes to the grass and comes to a halt on the green stuff. Hamilton is circling in the lead now, informed that his teammate is out of the race and thus the threat is neutralised. It's all about getting to the chequered flag for the Brit now. Bottas pits from second place, leaving his (perhaps one and only) stop very late. Vettel passes the pit lane, but Bottas rejoins ahead of the second Red Bull, comfortably third for now. All the drivers have stopped at least once now, with Kobayashi in twice and Chilton in three times. The top ten remain on the lead lap. Adrian Sutil, one place away from getting Sauber's first championship points this year, is the first of the lapped cars. Sebastian Vettel pits from second place, he takes on the medium tyres in a 3 second stop. He rejoins fifth ahead of a real scrap between Alonso and Magnussen. Vettel tries to defend but Alonso moves to the left of the Red Bull and surges ahead for fifth place. Toto Wolff confirms that they're not exactly sure what's happened to Rosberg's gearbox, but obviously a failure of some sort. He also adds that Hamilton's gearbox is slightly younger, and they're just trying to bring the car home in P1. Alonso hasn't managed to pull out a gap on Vettel, with the defending champion on the radio and reporting that Fernando is still running wide on occasion. Alonso has already been given a warning for this after Button's complaints. Vettel pulls alongside Alonso, and gets ahead but Alonso has the inside line on the following corner. They're side by side but the Ferrari remains ahead. Team radio from Adrian Sutil: "What's going on with the brakes again? How can I race?" Vettel still follows the Ferrari. Over the radio, he complained about Alonso's move, "I would have crashed into him!" he rants. Again Vettel hounds Alonso but Fernando manages to shut the door and keep the four times champion behind him. They're also taking turns complaining about each other over the radio. Hamilton reports his tyres are feeling good and have a lot of life left in them. We've got 12 laps until the end. Team radio to Jenson Button: "We think Ricciardo will go to the end, so we need to chase him down and pass him on track." 9 seconds between the pair. Hamilton pits from the lead for a good, clean stop that puts him back out comfortably in front. The fight is still on between Vettel and Alonso, there's barely anything between them as they scrabble for fifth place. Tweet from @clubforce: Checo is on a charge - gap to Vergne is now 6.6s. PUSH! Both Vettel and Alonso are constantly on the radio complaining that the other is not observing track limits. The FIA have yet to get involved, likely thinking these two should be experienced enough to sort it out amongst themselves! Tweet from @dr_mikki: "To report blocking, press 1. For track limit violations, press 2. To throw your toys out of the pram, press 3." Vettel started another move in the DRS zone and carried the momentum through the next four corners. Both cars side by side down the old pit straight before Vettel braked later and takes the position - fifth for the Red Bull driver now. Christian Horner was talking to the BBC commentators while that overtake was happening. "Come on Sebby," he said, which I don't think he'll ever manage to live down. Three laps to go and Jenson Button is running well in fourth place. He's not likely to catch Ricciardo as the team suggested he do, but a solid points result will be a big boost. Smoke is pouring from the rear of Maldonado's Lotus. Vettel, about to pass the backmarker, was on the radio saying: "I can smell something burning." Yea, that's Pastor. Yellow flags as the Lotus pulls off track and out of the way. 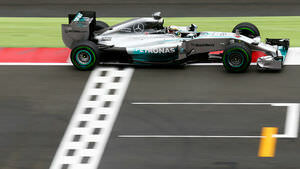 Lewis Hamilton wins the British Grand Prix!! Huge cheers from the crowd celebrating their home driver. Hamilton hauls himself half out of the car to wave at the grandstands. Valtteri Bottas crosses the line for a brilliant second place - up twelve places from his starting position. Third for Daniel Ricciardo. Team radio from Hamilton: "I couldn't be happier, I'm sorry about yesterday, but fantastic job today and this weekend, as always." Seems like Button had enough laps to close the gap to 0.8 seconds, but not quite enough to make it a double British podium. Hamilton makes his way to the podium, quick weigh-in, round the corner, up the stairs, it's quite a trek! Quiet in the green room, as Bottas and Ricciardo compare their one stop strategies. Hamilton looks a little emotional as he pulls on the Pirelli cap. The crowd flood across the track to make their way to the podium. Drivers about to make their way out to huge applause. There goes the national anthem, as Hamilton looks happy and proud. He points to the digi-flag, as the crowds continue to surge towards the podium to see the top three collect their trophies. The trophies are handed out and then, the champaaaaaagne. The gap is now reduced to just four points at the top. Williams have jumped Force India for fourth place now, and Ferrari aren't too far ahead. Podium quotes - Lewis Hamilton: "Just to see the support we have here, I could see everyone cheering us on through the whole race. It’s you guys that spurred me on, thank you so much. At the beginning, Nico got quite a good gap, I tried to look after the tyres. After that I was catching, we came out on the harder tyre, I was catching him a second a lap at the time. I couldn’t believe I had that kind of pace. You never want to see a teammate fall behind, we wanted to get the 1-2, but at the end of the day I needed that result." Podium quotes - Valtteri Bottas: "We’re on the right way, like I said on the team radio, one step more to go. The team has done such a good job, you see how quick the car is. It was behaving really well, it was a pleasure to drive it. Still Mercedes is in front but we’re on the right way. There was some good stuff going on, really enjoyed it. The plan was to come as high as possible, as high as the pace of the car is giving the possibility. I think as a team we made the most out of it. I have to say, I feel sorry for Felipe, his 200th Grand Prix, it’s a shame it ended like this." Podium quotes - Daniel Ricciardo: "Mark [Webber] enjoyed this track a lot, it’s nice to be up on the podium. Really happy, we just held on at the end. One more lap would have been tough, Jenson was coming, but really happy with the podium." The Mercedes team reveal that towards the end of the race, a very composed and professional Nico Rosberg helped them out with a tip to see Hamilton across the line. They won't say what it was, but props to Nico anyway. Would love to stay and chat, but the race ran an hour over and I've been typing far too long. Stay tuned to Sidepodcast for all the post-race reaction, results and ratings, and be back here in two weeks for Hockenheim!